embarrassing is the only way to describe the pulling power loaded i struggled to get 35 mph up a good hill in 3rd now it sits happily at 45mph in 5th without trying .more if i want. totally transformed the van cannot recomend it enough. We run a small fleet of Transit Dura Torc – all very late reg. We are seeking to improve economy further and currently have 70 mph speed restrictors. Can you improve on our current position? Can add a solid 30% more torque Steve on your late model Connect..
After owning my 90/350 crew cab for two years i decided to have a remap to increase my bhp and torque figures. Martyn was very helpfull and even came out to the vehicle on site. The drive home was very different no loss of forward speed up hills. I can now keep up with the flow of traffic. This remap has transformed my pick up and i now prefer to tow with the transit over my landy. Thumbs up to vantuner. hi , i have a 90ps (duratorq engine) non turbo , what could be done to give it more power and better fuel economy ? It will have a turbo Rob being a 90.. probably feels like it doesent have one though!! theres a list of maintenance items you can do to improve the performance, many of these can be found on the transit power tips page on this site.. once they are done a remap of your vans ecu will add a nice chunk of torque and may help mpg.. call me to discuss and i can advise you further.. 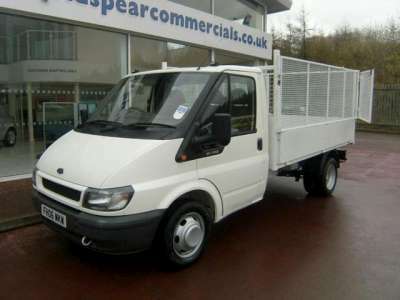 I have a ford transit mk7 100PS 2.4TDCI DRW T350 Chassis cab paired with a massive box on the rear with a semi usefull wind deflector. Im primarily looking for a MPG improve. As it currently ranges from 20-26mpg depending on load and wind conditions etc. So 370-460 miles from a tank. What kind of Fuel economy increase can i expect ( i drive @ 52mph on the Motorway ). And At 75mph produces a fuel economy around 16mpg. My rear diff ratio isnt great. 52mph = 2500rpm in highest gear. Hense why i drive like a sleepy 85year old. From a Decent remap. What bhp should i expect? And how much do you charge for your service? The man with a van service with a difference! Jumbo.’s tippers, Long Wheel Basers all get 10-15% better MPG Ophir , I’d expect yours will achieve the same… power gains depend a little on software version installed but 20-30% is the range thats safe & reliable & give great MPG gains…. Hi just purchased an 03 90T350 long wheel base high top transit. And very insterested in your tuning. im looking for the power tune. how much notice do you need to have the van booked in with you. Could you please let what the costs are.